Two-shaft Kneading and Extruding Machine KEX Extruder | Product Information | KURIMOTO, LTD. 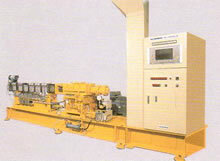 The Kurimoto's KEX series extruders are a unique two-shaft kneading and extruding machine developed by Kurimoto enabling you to process new materials. Kurimoto has a long list of successful accomplishments of conventional KRC Kneader (continuous two-shaft kneading machine) for the applications of continuous kneading and reaction of resins and others, and is highly regarded for its technical expertise. Kurimoto has developed and commercialized the KEX series extruders on these experience and technology in the field. The KEX series extruders are designed with thorough attention to high-temperature heating, high-torque drive, corrosion and wear resistance, precise controllability, and usability in addition to superb kneading capability, enabling you to process new materials such as plastic compounds and polymer alloy. Two-start and three-start types of screws are available. You can choose appropriate one for your applications. By combining the screw elements such as screws of different pitches, reverse screws, and special kneading discs on the screw shaft, you can choose a best-suited screw profile for your kneading requirements. The screws and kneading discs have superb self-cleaning capability. Furthermore, the screw shaft and screw elements are fixed with a spline. The barrel is separated into segments having the order of 4D in length respectively. Therefore, various types of barrels are combined to use according to your applications. You can choose a barrel from feed barrel, standard barrel, vent barrel, dehydration barrel, liquid injection plate, and others. Normally, common steel is used for the barrels and screws, while heat-resisting, corrosion-resisting, or wear-resisting steel is used according to the applications.